There is a mating XT60 connector attached to the tile, this gets soldered to one end of the speaker or “hook up” wire. 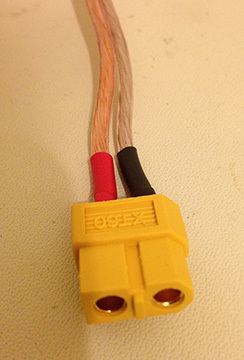 There are + and – marks on the XT60 connector. 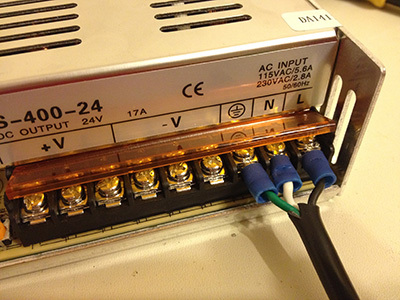 The other end mounts to the + and – 24v output terminals on the power supply. Some heat-shrink is also good to apply over the solder joints to reinforce them. To plug the supply in to the wall, you just need a grounded plug, this can be any extension cable or pc power cord. Cut the end off that does not attach to the wall, and strip the wires. There will be a green/brown, white/blue, and black cable. 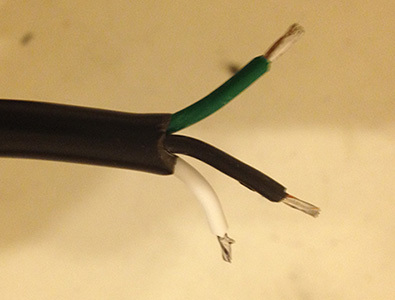 Black is the “hot” wire, it connects to the L terminal, white is neutral, or negative, and attaches to the N terminal, and green is ground and connects to the T looking symbol. 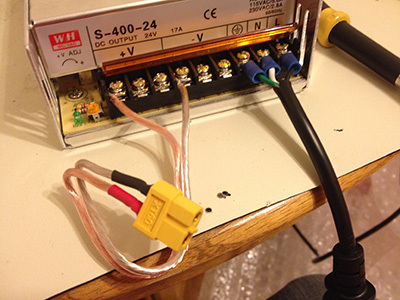 You can optionally crimp or solder connector plates to the end as shown. The final product will look similar to this, your cables may vary in length.